When it comes to tequila, there are pretty much only two ways that American’s consume this spirit. Either by throwing it back quickly from a shot glass or in a margarita with the glass rimmed with salt and a lime slice. If you’re shaking your head right now, then you need to forget everything that you know about drinking this ubiquitous booze and get ready to learn how to drink tequila like a pro. First things first, you can’t properly drink it if you’re not buying a bottle of the high quality stuff. Skip tequila brands that are “mixtos tequilas” because they are barely tequila at all! With those, you get around 51% tequila in the bottle, and the rest if often a mixture of cane sugar or other sugars that definitely are not tequila. Instead, you only want to drink the good stuff that is made of 100% blue agave cactus. Blancos tequilas are the purest offerings on the market. Also known as plato or silver tequila, this premium top shelf variation is actually clear in color, unlike some of those imposter (and inferior) varieties most cheap Mexican restaurants serve you. Generally speaking, tequila is like any other liquor in that the older it is, the better it tastes. Of course, this can be a matter of personal preference. The older it is, the more mellow the taste, which means the more palatable it is when you drink it. In fact, that cheap, terrible tasting tequila that you find it most bars is pretty much fresh off the truck, which is one of the reasons why it tastes so bad compared to the good stuff. Blanco tequilas have more of zing to them as they retain the zesty flavor of the agave due to only aging about two months. Reposado tequilas offer a more woody, aged taste and spends anywhere from more than two to less than 12 months aging in the oak barrels. Añejo is a more aged variety that spends between one and three years in the aging barrels – this variety is when you start to see the color change from clear to a golden hue. The most aged is the Extra Añejo variety, which spend more than three years aging for optimal taste. One important thing to note is that just because a tequila appears amber or gold in color, does not mean that it an aged bottle. In fact, some brands are taking blanco tequila and adding golden color, sometimes by mixing in a small amount of añejo tequila. This tomfoolery is usually sold under the varietal name of joven tequila. Now that you know how to identify the premium bottles of tequila, you might be wondering if you will be able to afford to treat yourself. Well, it’s no secret that the bottles of the high quality stuff has a higher price tag than the cheap stuff. But, for those on a budget, there is good news. 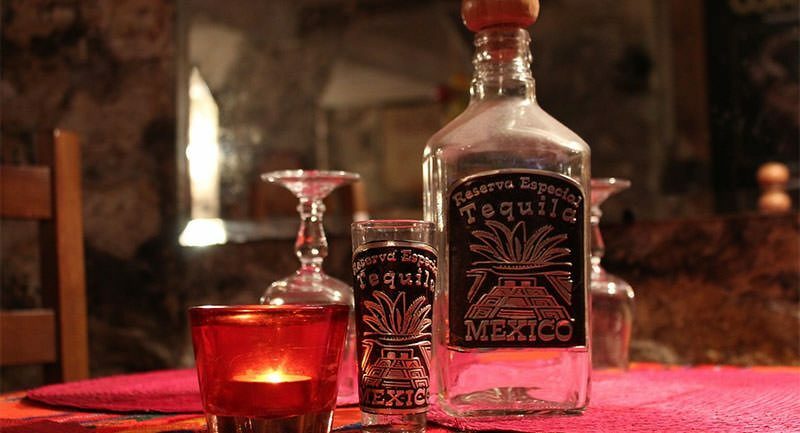 Reposado tequilas have a good taste and an affordable cost. Honestly, you shouldn’t be buying anything less than reposado. In fact, you will be able to sip a reposado and actually enjoy the flavor, unlike cheaper varieties. Of course, añejo and extra añejo have a smoother taste that is more enjoyable to most aficionados, so keep that in mind if your budget allows for it. Don’t bury your tequila in a frozen margarita, unless you just really enjoy those. Instead, get yourself some good tequila sipping glasses and take a moment to savor each sip. Our favorite is this affordable 4-glass set. Just pour yourself a little and sit back with it to enjoy the flavors. Before you know it, that after dinner scotch will turn into after dinner tequila! And whatever you do, don’t drink your tequila with sugar or any sugary liquids. Why? Because you will most definitely get a hangover. Drink your tequila by itself or without any sugar, and you should wake up hangover free the next morning. If you want to read up on more tips, and learn about tequila tours in Mexico, I found this great resource.